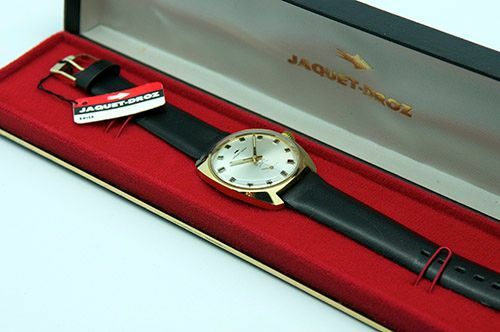 Jaquet Droz, owned by the Swatch Group, wasn’t always the high-end brand as we know them now (see my former post). 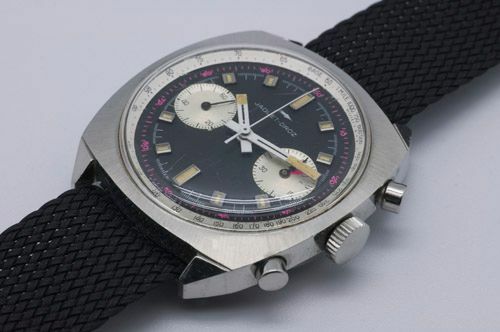 In the 1970s, Jaquet Droz produced watches using mechanical movements by A.Schild (and probably Landeron for the chronograph movements) for a decent price. Once in a while, you will see them pop-up on eBay or Chrono24 and prices start around a few hundred dollars to $1,700 USD. As you can see above, I was able to borrow a NOS Jaquet Droz and take some pictures of it. The watch was still in the original box and had its original Jaquet Droz tag on it. Never worn. The other model is a chronograph in stainless steel and has these funky looking purple minute markers. This two register chronograph is probably powered by a Landeron movement, as the owner couldn’t tell me and I didn’t want to open the case back. The perfectly brushed cushion shaped case reflects the 1970s perfectly and the hands are very cool as well. My guess is that these watches are not very sought-after and will (and can) be affordable for collectors of vintage timepieces. However, these watches do not reflect the current level of finish and quality from Jaquet Droz. Jaquet Droz doesn’t even mention this era in their history overview. 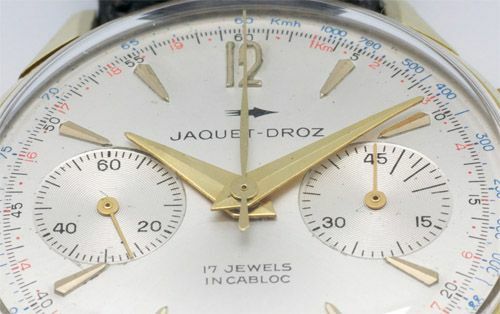 There is currently a vintage Jaquet Droz up for sale for 250 Euro (click here).